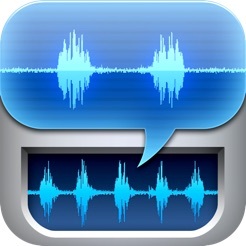 Record, Import, Cut, Arrange, Share — With the ability to adjust the sensitivity of the mic, cut snippets using a very precise zoomable waveform, combine snippets from multiple recordings, make your own Soundboard, import files via WiFi / iTunes, and output files via Email / WiFi / Facebook / Twitter / iTunes / Other Apps like DropBox, etc, this app becomes really useful real fast. 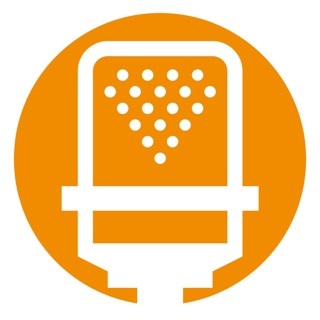 Record voice notes, interviews, lectures, ambient sounds, podcasts, etc; Cut out parts most important to you and share it with ease. Import audio files via Email, WiFi or iTunes and edit them on the go. Export those edits when you're done and use them as you will, saving yourself valuable time. There's a ton of different things you can do with this full featured app, and at this price you really can't go wrong. Go to www.tapparatus.com for a fun video demo or to email us with any questions or issues. Please remember that there is no way for us to respond/help via comments, so email us if you have any questions or concerns. - Record in the background. 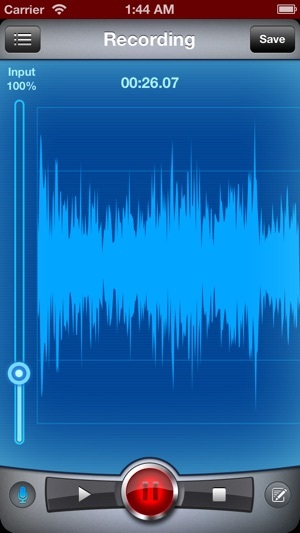 - Real time audio wave lets you visualize what you're recording. - Adjustable mic sensitivity lets you record from further away, or avoid clipping of loud audio, resulting in the best possible recording. 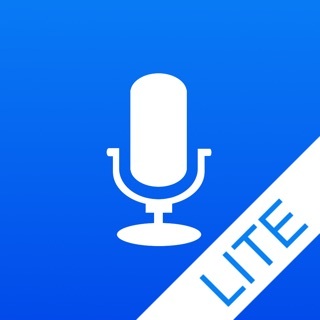 - Script view lets you have notes in front of you while recording. - Auto save makes sure you never loose a recording if you close out by mistake. - You can import any audio file from other apps like Mail, DropBox, etc, using their 'open with...' menu. - You can import any audio file via WiFi over the same local network. - You can import any audio file via iTunes File Sharing. Simply copy the file to the app and it will recognize it next time you open the app. Tip: You can even import some video formats like mp4 and it will extract the audio for you. - Play the selected snippet or the entire recording. Tip: Double tap Play/Pause to start from beginning. Tip: Press and hold the wave if you don't want it to scroll while playing. 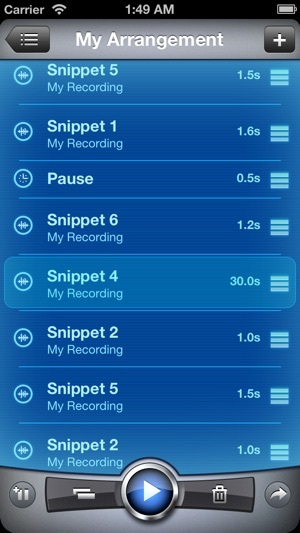 - Use snippets from multiple recordings. - Add pauses, rearrange, duplicate, or delete any snippet. - Fine tune snippet selection without leaving the screen. Tip: Rotate the device 90deg to get a Soundboard view — play your snippets by tapping around. 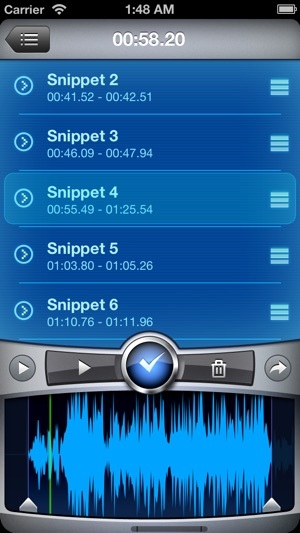 - Share your snippets, arrangement, or just the recording. - Email as an attachment as a WAV or M4A. - Use WiFi to download from your computer's browser. - Post on your Facebook wall. - Tweet it to the world. - Use USB using iTunes File Sharing. Tip: You can copy/paste twitter’s share link to send it some other way. - iPhone or iPod Touch with 4.3 firmware or later. Note: Due to iPhone limitations, you will not be able to record during a phone call. - Don't ask to save recordings, do it automatically. This should help accidental discarding. - A more accurate waveform representation. 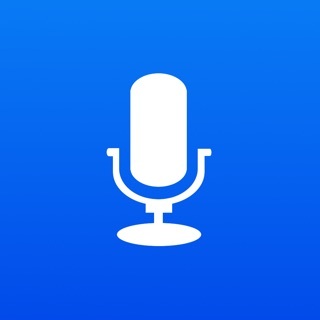 - Properly notify if microphone is not available due to iOS7 settings. - Fix bug with not being able to email m4a files on some devices. - Fix being able to adjust a snippet within an arrangement. - Few other minor bug fixes. I have a project due tomorrow for my Intro to Flash course and it requires audio. This app allowed me to import recordings straight from my text messages and from my email, clip them exactly where I needed to, and then export them to another app for conversion or to my email. All quickly, precisely, and easily. The interface is very user friendly and the response time is smooth. I only wish it did two more things. One of my files has audio that's too quiet, so I had to export the recording to another app to increase the volume. It also had to be in MP3 format to be compatible with my animation software, so I had to transfer all my chosen recordings to another app for conversion. For what this app does, it is fantastic. I highly recommend this to those who need to record AND edit audio files without a full-scale sound booth. Best in class, IF at all others can compete! I have had this app for a while, I got it coz I thought I might use it. For the last 2 or 3 weeks I have used it quite a bit. I love(d) the ability to post to Facebook (which just stopped working!!). I'm now posting using twitter which feeds to Facebook :-)! I love ability to wifi and download to my computer (super fast), to edit, attach to videos etc. Among the best features is ability to control input. I record at events and wanting clear sound, I created wiring that allows me to record before the sound is amplified and sent to speakers. iPhone 3GS now converted to iPod works great as it does not have noises that I would have got recording through laptop. Thank you again for awesome app! It just works! I love it. After years of struggling with the clunky Fire recording app, I am now heaving a big sigh of relief. I love iSaidWhat?! It's simple to record. 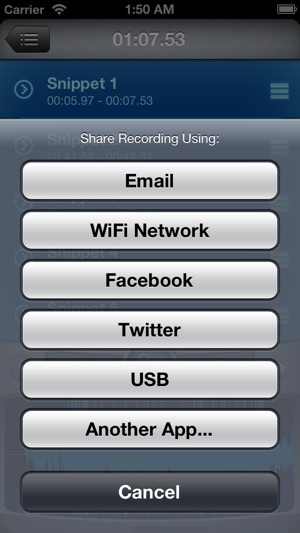 Simple to get recordings in from other applications, or to get them out via email or to social share sites. The interface is not gorgeous, but perfectly clear. The share process is fast. I've been using it to record hour-long talks with a lavallier mic plugged into the headphone jack of my iphone. The recordings are clean. Not a hitch so far. Good job!